Hello and welcome to ESPN's live coverage of the Spanish Grand Prix weekend. Next up its the third and final practice session - the last chance to get the cars sorted ahead of qualifying. The sun is shining in Barcelona, so we should get another hour of running. The wind has dropped slightly but drivers complained yesterday of a very slippery track - it will be interesting to see if they can all find a bit more time on the tardy hot laps they set yesterday. As always, feel free to send your questions and comments and I'll do my best to answer as many as possible. start time of P3 at 08:00 on 09 May." It's the first time they've done it this year and they get to do it twice anyway, but proof they were working hard to investigate the fly away engine cover from Romain Grosjean's car among other things. @HG: I think it looks like Ferrari has a bigger deficit here than they had in Bahrain. That doesn't necessarily mean they have gone backwards, it's also because the Mercedes seems tailor made for this circuit. However, Ferrari had a lots of upgrades to assess yesterday, so maybe we will see more of their true pace today. Chief among the Ferrari updates are the newly-sculpted Ferrari sidepods that you can see here. Looking at Raikkonen's Ferrari in the garage and it looks as if he has gone back to the old Ferrari aero package. Interesting as it suggests yesterday's data was not all positive. He can still go back to the new spec stuff, no doubt Ferrari will compare his data with Vettel today. Track temp is 21C and air temp 23C. The teams can expect the track to get as much as 25C hotter in time for qualifying. Installation laps completed. The first few laps are now being set - a 1:29.027 for Ricciardo leads the way. @mfbull: Apologies to those who were being linked to the wrong page from the homepage. Welcome back! Mehri locks up the front right of the Manor and ploughs straight on into the run off at Turn 1. Plenty of tarmac to explore out there so no damage done, apart from to the tortured Pirelli. First few laps complete. Time to box and get back in the garage. Ricciardo had all the Renault problems yesterday, it looks like its Kvyat's turn today. The Kvyat Red Bull is up on jacks with its bodywork stripped off. Meanwhile, the new nose has made its way on to Ricciardo's car for the first time. @RCC: Do not be concerned, Nate is fine (last time we checked). He's enjoying some Spanish sun this weekend and is out walking the paddock and watching the cars up close. He'll be back chatting to you guys and girls in Monaco. I would have thought Jorg would have been Alonso's and Kazu, Button's. @Laurence, do you have any insight news on bottas signing "pre-agreement" with Ferrari ? @Eskay: A pre-agreement has not been signed, but that doesn't mean conversations aren't ongoing. But it's in both Ferrari's and Bottas' interests to let the rumours swirl around as they explore contract options with Raikkonen and Williams respectively. any visible aero upgrades on the mclaren ? @Salman: McLaren has a new front wing, which seems to be making it a bit more competitive but not necessarily that easy to drive. 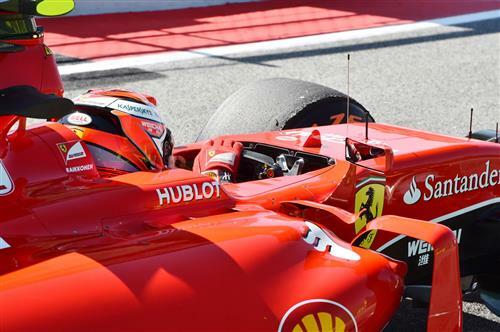 Raikkonen already looking better with the old aero! Raikkonen is indeed fastest at the moment with a 1:27.330. Vettel second fastest on a 1:27.840. Nate has been down to Toro Rosso this morning for a breakfast of Red Bull and paella. He reports that they are confident they can out-qualify at least one Williams today. Predicted 6th and 8th. Too much aero in F1, or is it not enough? Too many rules about it for certain. @laurance what u are expecting of hulk's future to be? can he get a better seat or move to LMP? @krishna: It's hard to see where he will end up in F1 at the moment. He's talented enough for a top team but he still hasn't been given a break. Personally, I think he could forge a very long and prosperous career in LMP1 with Porsche. I'm surprised the Red Bull didn't make the paella come back up. Is there anything to the rumours of a VW or Audi replacing Renault at red bull? @Tazio: There's lots of those rumours doing the rounds, especially since Ferdinand Piech left the VW board. It was interesting to hear Gerhard Berger stirring the pot on Sky yesterday by saying Mateschitz has been trying to get VW involved for years. However, VW Group has invested heavily in WEC with Audi and Porsche, so it remains to be seen if there is any value in even more investment in F1 - especially with the struggles Honda has faced coming in a year later than the rest. We should also say that Red Bull has a contract with Renault until the end of 2016, so any talks are realistically focused on 2017 at the earliest - but even that would be a push for a new manufacturer. @Tazio: They'll probably wait for Dieter to quit first so they can drive down the price. @laurence, is it true that merc is underplaying their power units to have the rules retained for next year or has Ferrari really really caught up on speed with merc ?? @Eskay: The rules will be the same next year, it's 2017 when they are up for debate. I think that theory is unfair to Ferrari, who realised the errors of their approach very early last year and took some big punts on different ideas with long lead times and they paid off this year. It seems some of the slightly tactical driving employed by Hamilton (in China specifically) that has perhaps got mixed up in public perception. I wish F1 hadn't ignored America for so long, we need more F1 jobs here so I can get one. Would love to see a manufacturer like Ford back in the game. Anything being planned to make the cars faster and loud? At the Aus. GP, the sedans in the support race made the F1s seem like a side show (almost)! Surely something will be done to take F1 back to the pinnacle??? @Alberto: Increasing the fuel flow is on the table for 2017. That would allow higher revs, which would create more noise. However, don't expect a return of the V8 screamers. @JamesZara: They have changed a lot this weekend, but it seems some of it wasn't working for Raikkonen this weekend. Vettel is still happy with it though. Rosberg is currently fastest with a 1:26.777. Hamilton spins at Turn 3 on the exit!